So this book has been sitting on the backburner for a while. Goodreads tells me that I finished it at the end of May this year…so that’s five whole months where I didn’t review it. Heh…oops? And this isn’t the only book still waiting to be reviewed either. Eep. You guys know my love for audiobooks these days. If you don’t — well I love it. When I started full time work back in April, I found it extremely difficult to get much reading done (lel this hasn’t changed much let’s be real). Even during my daily train travels, I just wasn’t in the mood. Then along came audiobooks and I found a saviour to my TBR. The Family Law is very different to my usual reads, which I’m sure you can tell. I’m not a huge fan of autobiographies, but heck it was free on Audible (I think it was a Christmas promotion?) so I decided to give it a go. And I’m so, so glad that I did! 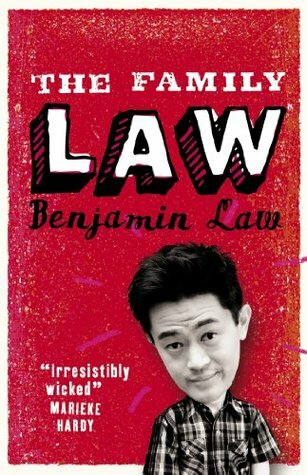 I was not familiar with Benjamin Law when I started this book, so I basically went into his story blind. I didn’t even read the blurb beforehand…I mean it was an autobiography…how much can the blurb really tell me? Turns out, Benjamin is a pretty well-known Australian journalist and author. And he himself narrates the book, which added the authenticity that I didn’t even know I wanted. The Family Law is a memoir of the Law family, a collection of 23 short stories from Benjamin’s time growing up on Australia. He recounts his childhood through to young adulthood, sharing some great snippets into what life was like for him, his siblings and the whole Law family. Being an Asian family living in Australia, many of the everyday trivialities was definitely relatable for me — especially the mum, who was just hilarious and I laughed in public more than once because of her antics. For example, Benjamin recounts in detail about her sharing stories about the birth of her children with him and his siblings, despite protestations from everyone. The Law family was crazy and funny and each chapter just got more hilarious than the one before. I think it was accentuated by the fact that he himself narrated the book, and did a brilliant job of playing up the voices and emotions required from each story he shared. Most of the stories shared was light-hearted, but there was occasionally a few moving moments too. Even if you’re not a fan of autobiographies, I highly recommend The Family Law. If you’ve always wanted to start reading autobiographies but have no idea which one to pick up, then this is a good place to start.